"Gustave Le Gray" signature stamp in red, recto print, lower right. Gustave Le Gray recognized that this bleak factory was a highly unusual subject. 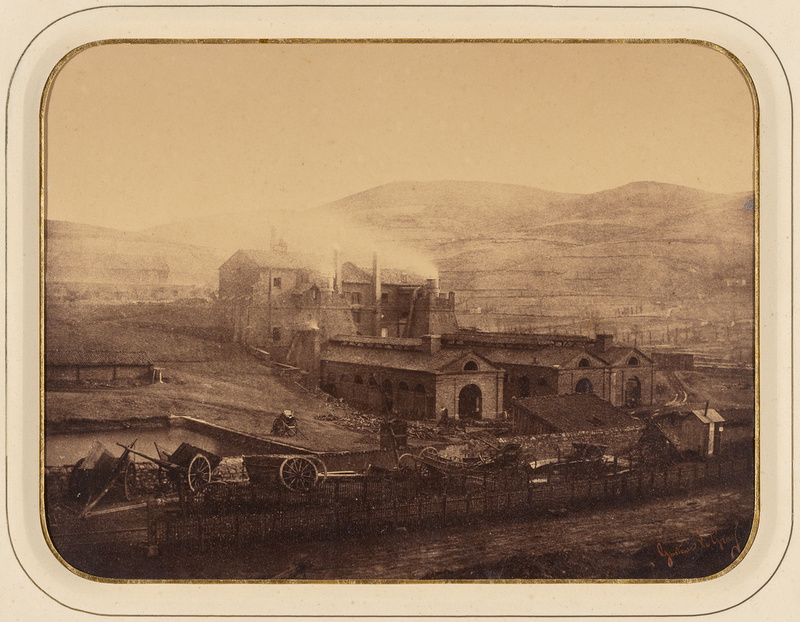 Heavy industry was rarely a motif for photography in the mid-1800s. Rather than shying away from it, however, he masterfully recorded the blackened foreground and spreading clouds of smoke that veil the deforested hillsides. Le Gray made this picture at Terre-Noire (Black Earth) in central France, an area rich in coal and iron ore, raw materials that are essential for the production of iron and steel. Hellman, Karen, ed. Real/Ideal: Photography in Mid-Nineteenth-Century France, exh. cat. (Los Angeles: J. Paul Getty Museum, 2016), pl. 128.